"Kojima-san Doesn't Have To Make Metal Gear Any More"
More than 45 Kotaku readers have taken their orders from Hideo Kojima himself and are attempting to free the man from making Metal Gear games for the rest of his life. At the end of my interview with Metal Gear creator Hideo Kojima last week, I asked the renowned game developer about the desire of many of our readers for him to make games other than Metal Gear. 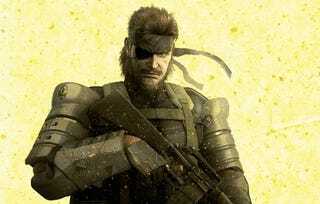 It's been years since Kojima attached his name to projects like Boktai or Zone of the Enders, and while he may have a supervisory role on the next disc-based Castlevania game, he's been consistently making Metal Gears for most of his recent career. Up next for him are two more: Metal Gear Peace Walker on the PSP and Metal Gear Rising on the Xbox 360 and PlayStation 3. "Not only the Kotaku readers but I myself am interested in doing something besides Metal Gear," he said. "But, right now, I am working on Peace Walker. Eventually, after the project is done, I might think about it." He joked: "If you write that 'Kojima-san doesn't have to make Metal Gear any more' every day on Kotaku, and write to the CEO of Konami and tell him that, then it might be easier for me to make non-Metal Gear games." It's not like the Metal Gear games that Kojima is still making are bad or anything. The new PSP one actually seems to be very good. But since the publication of my Kojima story on Friday, at least 45 readers have written the sentence "Kojima-san doesn't have to make Metal Gear any more" in the comments section to that post. I promoted the comments to make them easier to see. So just remember, if and when Hideo Kojima announces that he's making a game that isn't Metal Gear, you'll know what caused it. That said, we won't be publishing that sentence every day here on Kotaku. The point has been made.